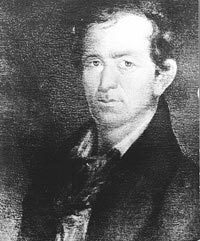 A native New Yorker named Erastus Smith was on his way back to his home in San Antonio in 1836 when members of Santa Anna's Mexican army accosted him and his son-in-law, Hendrick Arnold. The two had been away on a hunting trip and didn't know the Texians, that group of rabble rousers dedicated to independence from Mexico, were about to lay siege to his adopted hometown. Truth is, he didn't care. Smith wasn't much interested in the politics of the day, revolutionary or otherwise. He had lived in Texas since 1821 and married a Tejana widow, Guadalupe Ruiz de Duran, and was busy raising a large family in San Antonio de Bexar. A childhood disease had nearly killed Smith and caused a partial but permanent loss of hearing, leading to his nickname Deaf. Stephen F. Austin had personally appealed to Deaf Smith for his services in the upcoming siege of Bexar, but Smith refused. He was comfortable in both the Anglo and Mexican cultures and neutral in the battle for Texas independence. His attitude changed when Mexican soldiers, on high alert for Texians, refused to let him and Arnold, a free black and later a member of Smith's spy company, back in town to see their families. Deaf Smith wasn't neutral anymore. He wrote to Austin: "I told you yesterday that I would not take sides in the war but, Sir, I now tender you my services as the Mexicans acted rascally with me." Santa Anna's army would have had a much easier time of it in the upcoming months if they had been less rascally. Smith went to work primarily as a spy but also as a soldier for the Texians. He gathered crucial intelligence for the Battle of Concepcion and later spied a mule train that might have been carrying gold and currency to pay the Mexican army. James Bowie and some others decided to attack it, resulting in what's known as the Grass War because the wagon train carried no gold or currency - just grass for the soldiers' horses. Smith took part in the siege of his adopted hometown of Bexar and was wounded there not far from where another Texas patriot, Ben Milam, was killed. He took his family to Columbia but continued to serve the Texas cause. He served as a courier at the Alamo, delivering William Barrett Travis' famous "Victory or Death" letter. Later, he endured the task of relaying to Sam Houston in Gonzales the fate of the Alamo defenders. Houston put Smith in charge of new recruits at Gonzales. The volunteers under his command acted as sort of a special forces outfit, fighting like soldiers and gathering intelligence like spies. Smith captured a Mexican courier at Harrisburg who carried with him detailed dispatches about where Santa Anna's soldiers and artillery were located and how many were at the various locations. That information had a lot to do with Houston's decision of when and where to attack. On April 21, 1836, when Houston's troops surprised Santa Anna at San Jacinto, Smith and his men destroyed Vince's Bridge, making retreat or reinforcements impossible for both sides. It was a do-or-die kind of act. After the war, the Republic of Texas gave Smith a prime piece of property -complete with a house - in downtown San Antonio, but he and his family stayed in Columbia where he raised a group of Texas Rangers to run a band of renegade Mexicans out of Laredo. He moved to Richmond soon afterwards and died there on Nov. 30, 1873. Upon hearing of his death, Houston wrote: "My Friend Deaf Smith, and my stay in darkest hour, Is no more!!! A man more brave and honest man never, lived. His soul is with God, but his fame and his family, must command the care of His Country!" Smith's passion for the Texas cause had little to do with politics. An officer during the siege of Bexar wrote Austin that Smith was "perfectly disinterested." Reluctant warrior that he was, Smith was as fierce and loyal a soldier as the Texians had. Deaf Smith County is named for him, and, for a time, Arrowhead Mills named its organic Deaf Smith Peanut Butter for the man and the county. And to think - if the Mexican soldiers had been less rascally with Deaf Smith on his way home that night, Sam Houston and history would have never known what a good man Deaf Smith was to have on your side.